Over the past year, he has held talks with right-wing groups across the continent from Nigel Farage and members of Marine Le Pen’s Front National in the West, to Hungary’s Viktor Orban and the Polish populists in the East. He envisions a right-wing “supergroup” within the European Parliament with as many as a third of the lawmakers which would have the ability to seriously disrupt parliamentary proceedings, potentially granting Bannon huge power within the populist movement. Born 27 November 1953 Norfolk, VA, he’s a fiery Sun Sagittarius with possibly a Leo Moon conjunct Pluto. What gives him his inflammatory rhetoric is a Cardinal T Square of Uranus opposition a Capricorn North Node square a showbizzy Mars Neptune in Libra. A focal point Cardinal Mars is reckless, openly confrontational and disruptive, revelling in head-on collisions, though has little staying power. Equally a focal point Cardinal Neptune is overly impatient and won’t stay the course to see visions take root, indulging in corner-cutting, quick n’ easy schemes that don’t involve long-term effort. His CV is littered with failures and multiple career changes. His rise-and-fall, self-defeating 10th Harmonic is strong. 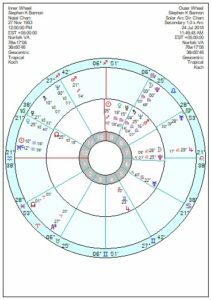 The stars are not well-aligned for his grandiose venture with tr Neptune undercutting three of his midpoints till late 2019; a dashed-hopes tr Pluto square his Mars/Neptune till late 2019 as well, which tr Saturn will also square over the May election. He’ll get a battery recharge in 2020/21 but by 2021 he runs into a catastrophic triple hit of tr Pluto square his Mars/Saturn as well as make a devastating square to his Neptune running till late 2022. Plus a blocked Solar Arc Pluto conjunct his Saturn. Then he’ll no doubt dust himself off and be after another windmill to joust at. 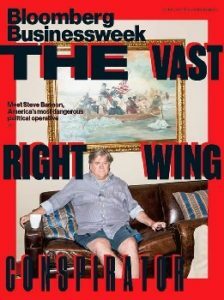 Going to be difficult for Bannon to pursue his delusions of creepy, nazi grandeur from prison. Interesting note. This project is most likely bankrolled by Mercers. There was a story on Bob Mercer owning 7 billion in backtaxes. I looked at Mercer earlier, and his skies didn’t look good, either. So, might be related. You mentioned that the UK will become more isolationist in the next decade. Do you think the right will also get ahead on the continent? It’s already moving in from the Eastern front in Italy Poland and Hungary. And now I am wondering if the Scandinavian nations Germany and France are vulnerable. This snake is more malicious and venemous than the politicians in Europe are used to. Even if he is personally unsuccessful he has managed to create a dangerous movement here. He might still leave a dangerously well funded far right body in Europe even if they kick him out a year later just as he did on the other side of the Atlantic. .
Europe is different than The UK in that nationalism doesn’t necessarily mean isolationism here – and yes, I really do not think The UK is fully Europe, starting from Judical system that sets The Uak apart. European Nations are typically small, and absolutely need to collaborate with neighbors in order to have working markets. Therefore, even Nationalist parties collaborate. Even Italian Lega leader Matteo Salvini and French Marie Le Pen are best buddies, despite the countries having often conflicting interests on International Stage. And, Bannon isn’t rally doing well here, either. He came here late. Most nationalist parties are homegrown and actually anti-American. He tried to meddle in Italian Elections, but only had access to Salvini, because Salvini, who has access to Le Pen in France and Putin, never seemed to gain one to Trump (Trump hasn’t paid much attention to Italy, but he’d definitely be much more drawn to Berlusconi), and thought Bannon could help. But Trump never liked Bannon, and if Mercer now has someone whispering to him, that’s Stephen Miller.